1992s Batman Returns introduced Tim Button's iconic vesion of Catwoman to movie going audiences and they were drawn to her like catnip.Now Catwoman joins the LDD Presents family with a doll that is sure to make fans purr with delight.The LDD Presents Batman Returns: Catwoman features her trademark homemade black vinyl catsuit with contrasting white stitches and a slick sheen. Mistletoe is deadly but this doll can be deadlier. Catwoman gives you a crimson smile with an all new head sculpt with full head mask, she completes her look with clawed hands and knee-high boots. 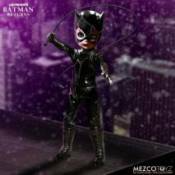 As Batman can tell you this kitten has claws.LDD Presents Batman Returns: Catwoman stands ten inches tall and features five points of articulation. She comes packed in a specially die cut window box purrrrfect for display.